Responses can be emailed to us at ldp@aberdeenshire.gov.uk or received via post, Planning Policy Team, Infrastructure Services, Aberdeenshire Council, Woodhill House, Westburn Road, Aberdeen, AB16 5GB. To support the preparation of the Local Development Plan (LDP) the publication of a range of documents are required including the Main Issues Report (MIR). The document highlights and explains possible changes to the Aberdeenshire Local Development Plan 2017 to inform the content of the Aberdeenshire Local Development Plan 2021. It is drawn from initial reviews of the existing plan and a Monitoring Statement (pdf 1.78MB). It also summarises the evidence base for the plan and focuses on the wider impact of the plan on the area and population. A Draft Proposed Local Development Plan – to support our findings and preferred options coming from the main issues – will be published with the Main Issues Report. A flood risk appraisal will be prepared to provide an overview of any flooding issues associated with development bids. Following on from early review by area committees in October 2018 Infrastructure Services Committee will be presented with a finalised Main Issues Report on the 29th November 2018. The published Main Issues Report will be based on the outcome of that meeting. This document remains an “Officers report” and has no material effect on future planning decisions at this time. Information contained in the report appendixes is based on ‘bids’ received from landowners and developers for land to be included in the Local Development Plan. We aim to publish the Main Issues Report in January 2019 for a 3 month consultation period. Please note that in order for comments to be considered as valid you must include your contact details. We will use these details to confirm receipt of your comments and to seek clarification or request further information as required. Should you have any concerns regarding the holding of such information please contact ldp@aberdeenshire.gov.uk. Anonymous comments will not be considered as part of the consultation process. Petitions will only be noted in the name of the person submitting the document. All comments received will be carefully assessed and will be used to inform the preparation of the Proposed Aberdeenshire Local Development Plan. There will be a further opportunity to comment on the Proposed Plan when it is published in December 2019. In early 2018, development bids were submitted for consideration for inclusion in the Main Issues Report. These initial bids can be viewed in more detail on the LDP 2021 Bids 2018 page. Planning Officer’s considered all the bids and their conclusions are shown in the table below. 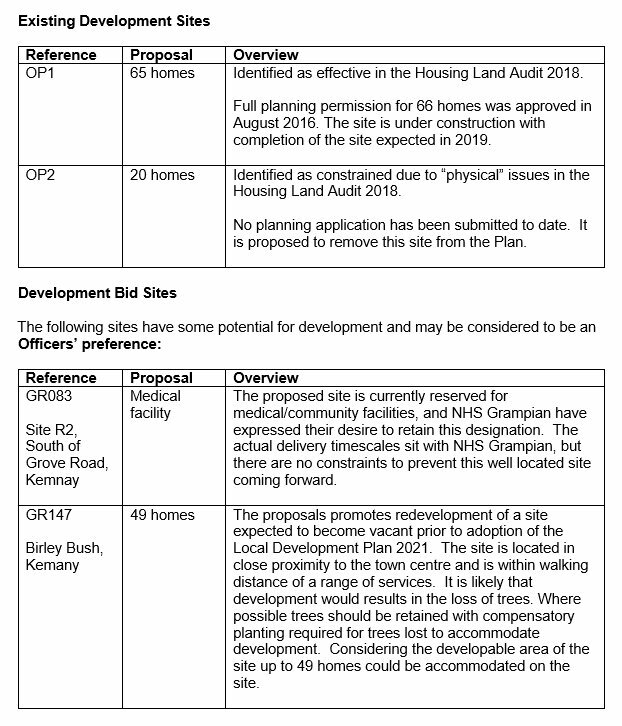 Note that there was a late bid GR147 for development at Birley Bush, this bid was not included in the original list supplied to Kemnay Community Council for discussions in June 2018. Details of this bid are minimal but what details are available are shown below. Kemnay is a traditional and diverse town set in the valley of the River Don, dating from around the 1860s. The town centre and Academy highlight Kemnay’s role in the rural community, and the town also benefits from an employment area to the north which includes the famous Kemnay Quarry. Sites safeguarded for business uses should be promoted, particularly for the start-up of small and medium sized enterprises. There are large areas of open space in the town and good access to a paths network in the Fetternear Estate. 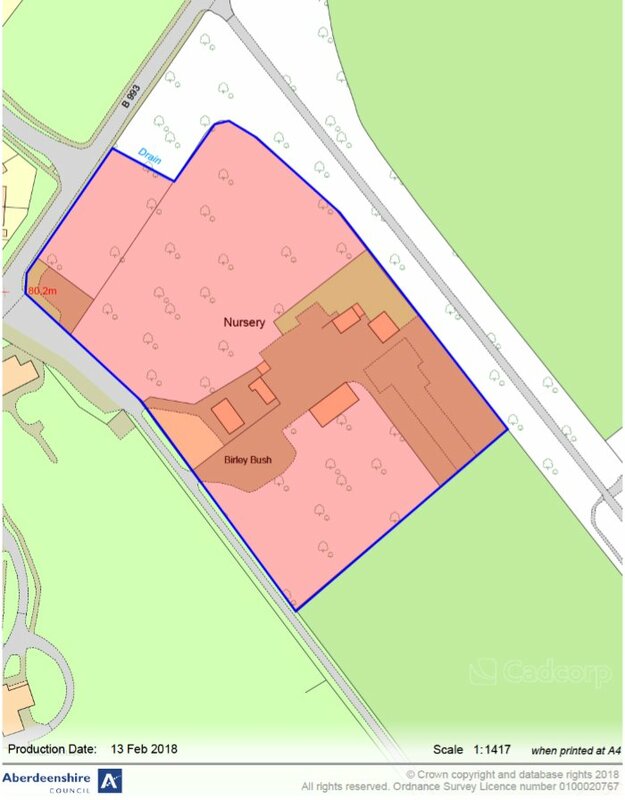 Academy provision has presented a constraint to development in recent years, although an extension to Kemnay Academy in the short term, and a review of Academy provision in the Garioch area over the medium term, will help to address this. The local community has indicated that improvements are required to local facilities including the library and scout hut. Delivery of a replacement health centre is of particular importance. Kemnay benefits from a diverse housing mix and further development at an appropriate scale, including smaller and affordable homes, will help to meet local housing need, sustain and enhance services within the community, provide opportunities for employment and recreation, and improve links to the path network on the edge of Kemnay. Flood risk is a constraint on development and a particular concern to the local community. 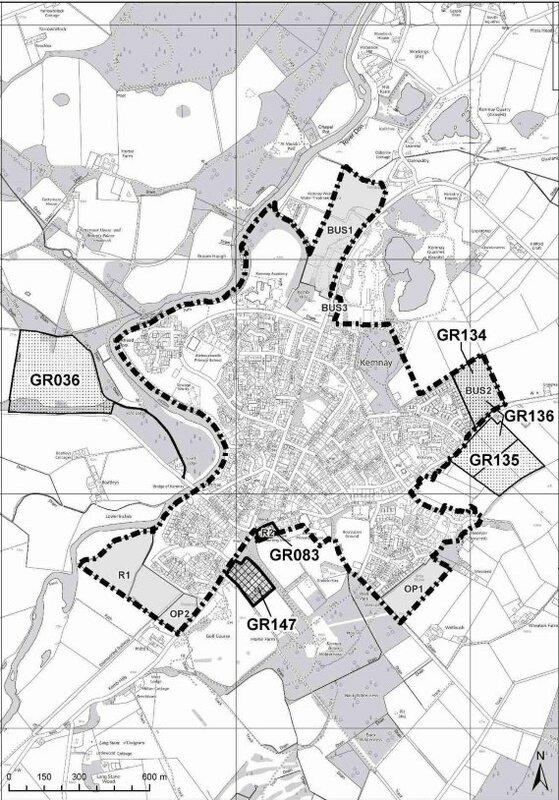 There is local desire for the delivery of a safe cycle route to connect Kemany with surrounding settlements including, Kintore, Inverurie, Monymusk, Alford and as far as Aberdeen City. • To support community facilities and services. • To provide opportunities for employment. Kemnay has experienced growth through the development of housing. However, despite sites being safeguarded for business use, employment opportunities have been lacking. It is important to maintain these opportunities for employment. 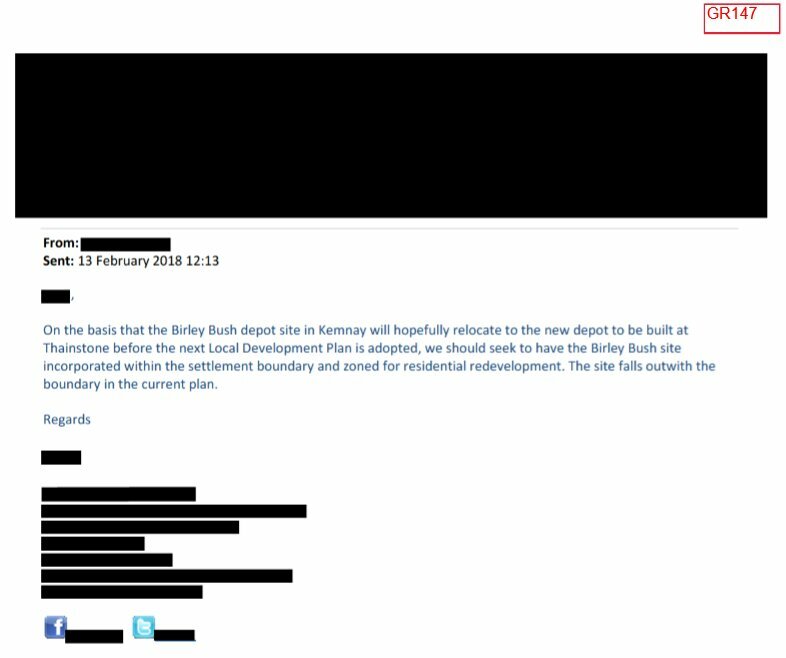 OP1 should be removed from the Plan on the basis that the site is expected to be completed this year. It is proposed to remove OP2 on the basis of non-delivery. 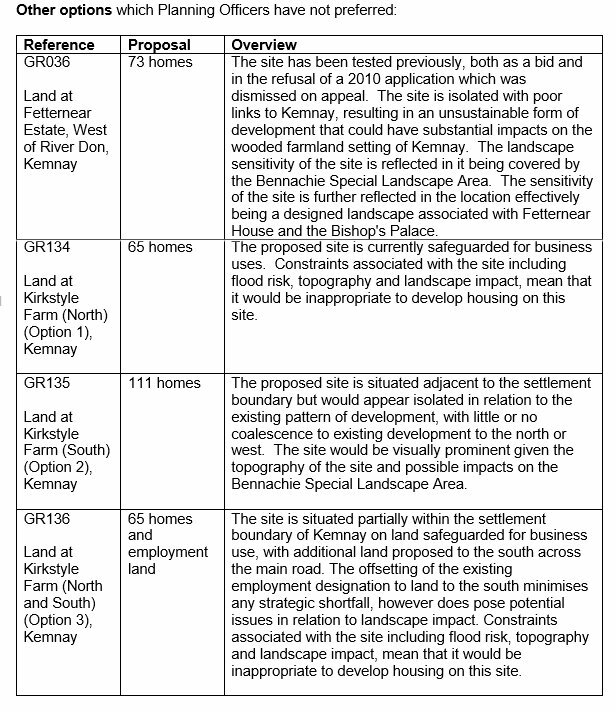 It is also proposed to remove site R1 as an all-weather sports pitch has been delivered adjacent to Kemnay Academy. The settlement boundary would be amended accordingly.